The release features every known SUN master and outtakes from Elvis, plus two private records and radio / concert performances from the period. This 3-CD package features 10 previously unreleased live cuts. The accompanying book is a fully-illustrated travelogue. It details the birth of Elvis' career through facts, anecdotes, documentation and rare photos. In the first hours of that extremely hot summer morning, I was leaning against a old leather chair, placed behind a wooden desk. Everything was very simple, melancholic even. In the desk there was a typewriter, a telephone and a old mechanical fan. I looked to my side, to the iron and glass door. The sunlight was coming thru the blinds and I tough about that poor young guy, full of dreams, entering and nodding to the lady seating on the desk. I imagined other people seating on some chairs, sweating profusely in that hot summer of 53, waiting for their opportunity. I tried to measure the size of a dream, of a desire so big to achieve something that is so distant, almost unreachable. I thought how a simple gesture, like have the courage to open a door, can change a person's life so radically. And I asked myself if Elvis, later in his life, remembered that moment and seeing everything that surrounded him, felt a bit scared. It was August 9, 2007, when I entered SUN Records for the very first time and my imagination flew to someday in July 1953 when he entered that same studio for the very first time to listening how he voice sounded like in a record. He paid $ 3.98 for that and changed his life and the life of millions upside down. He changed my life, yours, and the life of a guy named Ernst Jørgensen. Since he became the official Elvis record producer and researcher in the early 90's he traveled thousands of miles and searched old dust attics, garage sales, high school's files, old newspaper archives and every fragment that could reconstruct what came before, during and in the 29 months after that first summer. 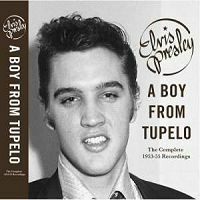 Along the way he found rarities, lost memories of those who lived those days, kept in wallets or in forgotten corners of the mind and put it all together in a historic project that couldn’t be better titled: A Boy From Tupelo. There's a certain melancholy when looking at the book's cover, the definitive document of this era, I can say it right here. A young man, with eyes full of hope and innocence, totally far away from the bright lights that would shine upon him for the rest of his life, after he opened that door. This is the Elvis of dusty highway bars, of parking lot gigs and high school gyms. Of days and nights inside a Cadillac with instruments on the rack, crossing muddy roads in the depths of USA. In the more than 500 pages of the book, Jørgensen creates a unbelievable and meticulous day by day account of Elvis first years in the road to stardom, trough numerous pictures, newspaper clippings and documents that tells how the biggest revolution in the modern music happened. A monumental task that took more than six years to be done and demanded more than 1700 hours of studio work. Almost everyday between July 1954 and December 1955 is documented at least by a picture, an article or an story. The photos, of which more than 200 are never before seen, show a young man sometimes shy and reclusive off-stage and totally at easy and confident upon it. Others show legendary places of Elvis history like Eagle's Nest in Memphis and the Louisiana Hayride. Unthinkable places like the parking lot of a drugstore or the gym of a high school are also documented in pictures. The research sometimes even revealed the color of Elvis clothing, something that the old black and white pictures can not tell. Stories told by local DJ's, joint owners, musicians, eye witness and promoters of the shows provides even more detail and take the reader to a wonderful trip to the genesis of Elvis Presley. "Hi Babies. Here's money to pay the bills. Don't Tell no one how much I sent. I will send more next week. There is a card in the mail. Love, Elvis." But the almost obsessive research of Ernst Jørgensen didn't only revealed pictures and documents, it also brought up new discoveries registered in acetates and in the old tapes of Sam Phillips. Spread trough 3 discs are unreleased takes of 'Harbor Lights', 'Blue Moon' and 'When It Rain It Really Pours'. Some are just fragments or false starts, but some, like take number 7 of 'Harbor Lights', gives the listener a wonderful insight of a yet insecure Elvis and his first try in a studio with accompaniment. Between takes its possible to hear studio chat between the musicians. Some few and precious seconds before Blue Moon Of Kentucky registered the excitement of Elvis, Scott and Bill with the sound they were creating. The biggest discoveries however, are in the third CD, containing radio broadcasts of the places where Elvis, Bill, and Scotty played. The most important of all is without a doubt 'Little Mama'. For decades, rumors persisted regarding its existence and those who claimed to have heard it made our imagination soar. 'Little Mama' was one of the songs from an acetate that also contained 'Tweedle Dee', 'Money Honey', 'Hearts Of Stone', 'Shake Rattle And Roll' and 'You're Heartbreaker', recorded in March 5, 1955 at the Hayride. The acetate found the hands of Sherif Hanna, one of the biggest Elvis collectors, and was necessary Ernst tenacity to have it on the project. After years of continuous play and a disastrous attempt to have it digitally transferred, the recording deteriorated to the point of being broke to pieces. Once in his hand, Ernst and his team dedicated a great deal of effort in its restoration. The sound quality, given the poor conditions, is more than satisfactory, making it possible to enjoy the new song and the first live version of 'You're Heartbreaker' with the same flavor of tasting something new. The restoration job also improved significantly the sound quality of 'Hearts Of Stone'. Other acetates also surfaced, containing unreleased performances of 'That's All Right' and 'Shake, Rattle 'n Roll'. It doesn't matter that these recording are hindered by tons of cracks, pops and hiss. Its simply existence gives the listener the opportunity to peak into a past that was thought to be long lost. In a way the wear these recordings bears gives it a aura of mystic, like if we could enter a time machine that could only take us to a certain point, were we could see the past thru a thin, uncrossable veil. The search also revealed two small interviews, one given to Mae Boren Axton, who in the next year would write the song that would catapult Elvis to worldwide fame. Ernst couldn't be more right. Ironically, just a few weeks after the announcement of the project, a unreleased, never before heard or know version of 'I Forgot To Remember To Forget' appeared out of nowhere, in no other place other than Youtube. It happened as the most fascinating discoveries happens, by coincidence. A nameless wire recording, long forgotten in a old record player that landed in the hands of a record player collector, clueless of the meaning and value of such treasure. Some may point it as an unfortunate coincidence for Ernst, but it really should be seen as a glimpse of hope. Hope that not all rocks were turned, that not every corner was searched and that some old chest in a dust attic still holds a unreleased piece of Elvis. A unreleased song, picture, or performance. We will keep dreaming with discoveries like this and until it not happens, we will keep listening to every know bit of record, everything he left behind. We'll go back to the books, to the pictures,to the movies and to the internet discussions. Most of all, to his music. He will be forever present. And all of this because one day, he opened that door.